DECKS – We build pressure treated, cedar, composite, and other material decks. We can use your design concept or we can show you our designs. We build decks on the main floor, ground level, 2nd-storey, as well as multi-tiered wrap-around decks. 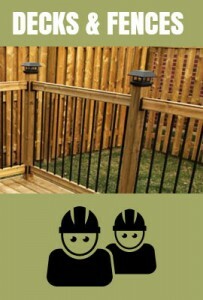 FENCES – We offer a variety of styles for pressure treated and cedar fences including privacy-lattice and semi-privacy. Whether it’s safety, security, privacy or curb appeal, we will guide you through the process to make sure your new fence enhances your property and meets your needs. RAILINGS – You can choose the railing style for your deck. There are many to choose from; composite rails, aluminum rails, clear/tinted glass rails, and wood rails. RETAINING WALLS – A retaining wall can be the perfect way to correct that stubborn slope in a yard. We offer a full range of retaining wall services including aesthetic and structural retention uses. We install decorative walls and barriers made of many different materials. We also repair and modify existing structures to ensure many future years of enjoyment. PERGOLAS/GAZEBOS – Add a key design element/aesthetic and shade to your garden, gate, walkway, hot-tub, or deck. This will make your backyard stand out from everyone else’s backyard and create a special oasis! GATES – We build a variety of styles for gates including single swing, double swing, arched, reverse arched, picket, straight modern, and many more. Tell us what design you want your gate to look like and we will make it for you! REPAIR & RESTORATION – We offer repair & restoration services including resurfacing decks, replacing joists, fence/deck boards, and gates. We fix flood damaged fences and decks! We also build new additions and remove old decks and fences.